46" WIDE, 28" deep, 28" high work area - our most popular width cabinet for auto parts! 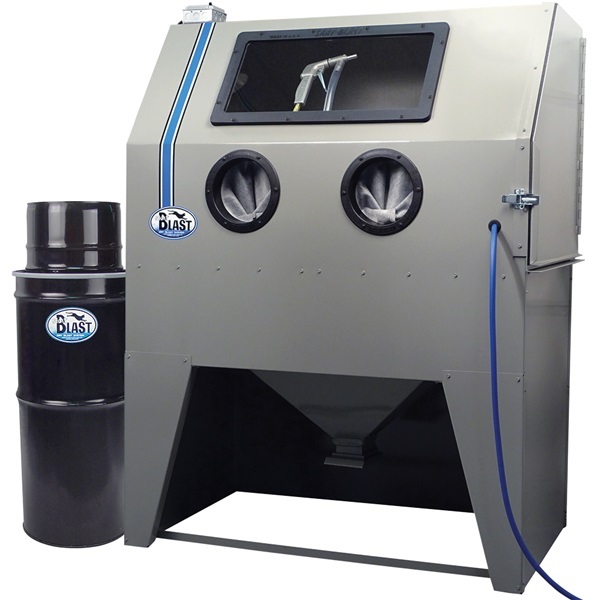 Our Skat Cat Series Blast Cabinets remove rust, paint, and scale FAST! They are always ready. Leave the cabinet hooked up to your air supply, so it is ready for operation at a moment's notice (no air or abrasive is used until you need it). Clean oil pans, fuel pumps, wheels, carburetors, cylinder heads, nuts, bolts, springs, pistons, valve covers, hinges, a-arms, headlights, grilles, air cleaners, trim pieces, manifolds, interior and under-the-hood parts – the list is endless ... the results are amazing! Big work area accommodates most auto or truck components. Can also etch glass or blast designs in wood! Easy to Use: Just insert rusty or painted parts and place on work screen. 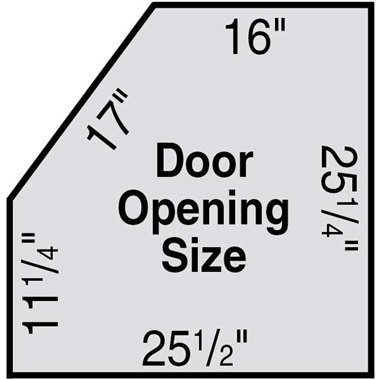 Close door, pick up part with one hand, and aim USA-Made S-35 Trigger Gun. 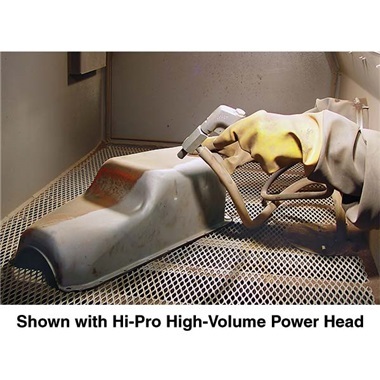 Each time trigger power gun is activated, rust, paint, and corrosion are removed FAST, leaving a beautiful satin finish on your part ready for painting or other final prep. Abrasive drops to funnel bottom where it is automatically recycled into pickup tube and up to S-35 Trigger Gun. Skat Cat Models with vacuum provide excellent visibility. There is NO DUST OR MESS. You always have a clean shop, as blast is confined inside cabinet. 3-5 HP air compressor required (10-15 cfm air @ 80 psi). SPECIFICATIONS: Overall size - 48"w, 30"d, 64-1/2"h. Work area - 46"w, 28"d, 28"h. 11 ga steel door with welded angle-iron framework, 20 ga steel body. Requires 10-15 cfm @ 80 psi. (For 7-10 cfm order low air supply nozzle setup - #6311-04.) 125 psi max. 5 ft vac hose & Vac-50 HEPA Vacuum System. Fully Assembled. Crate size: 56"w, 34"d, 70"h. Ship wt: 370 lbs. IN STOCK - Ships Quick - within 24-48 hours! Made in USA! Ship wt 370 lbs motor freight. Unload or Liftgate Service is available for this equipment (extra cost, in addition to freight adder). Click on Unload or Liftgate Service in suggestions below for details. 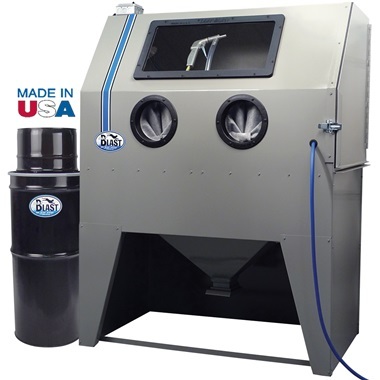 For commercial or shop use, or if you plan on using your Model SC-46 or larger cabinet more than an hour a day, we recommend our 180-DC Dust Collector. Call for additional cost and to order. I should have bought this years ago. Am now in the hobby of restoring cars. Much easier than trigger model. It is made well. A major upgrade from the previous trigger model I was using. My hand and fingers are no longer locked up after blasting. I have large feet and they fit no problem. Happy with this purchase. Will see how it holds up over the years. Made in the USA. I bought the gun and foot pedal to switch from a trigger gun setup to reduce hand fatigue (no trigger) and to eliminate surging. Make sure you buy one of their siphon tubes at the same time. It makes a world of difference and eliminates the surging everyone else blames on "wet" or "damp" media. Great Deal!! As always,..Very High Quality!!! I bought our blast cabinet for the shop over 20 years ago. Still have it and it has held up incredibly well!! Great product to freshen up a used and neglected Skat Blast cabinet.